Blue Mt. Genealogical Society, south of us in Oregon. Washington State Digital Archive had its grand opening on October 4, 2004. Since then millions of electronic records have been made available. Read the latest news using the News link on the menu bar. Check out the types of record available using the Collections link on the menu bar. 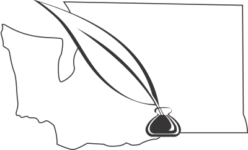 Washington State Genealogical Society. Included in their information are genealogical resource guides for Benton and Franklin Counties. While these documents were prepared several years ago much of the content is still accurate.